Left: Bryant Middleton, 64, earned a Purple Heart in Vietnam after being released from the Dozier School. He says he would return to the Vietnam War before he'd go back to Marianna. "At least in Vietnam, I could fight back," he explains. "In Marianna I was at the mercy of those who brutalized me." Right: Thirty-one metal crosses mark a small clandestine cemetery at the Dozier School for Boys in Marianna, Fla. Researchers were later granted permission to perform exhumation work at the cemetery and discovered fifty-five sets of human remains. 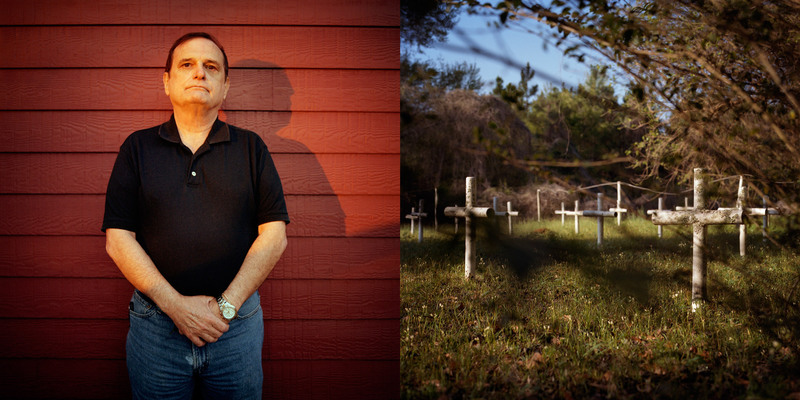 The crosses, placed by a boy scout troop, did not correspond to the locations of the graves.